India is a land of diversity. 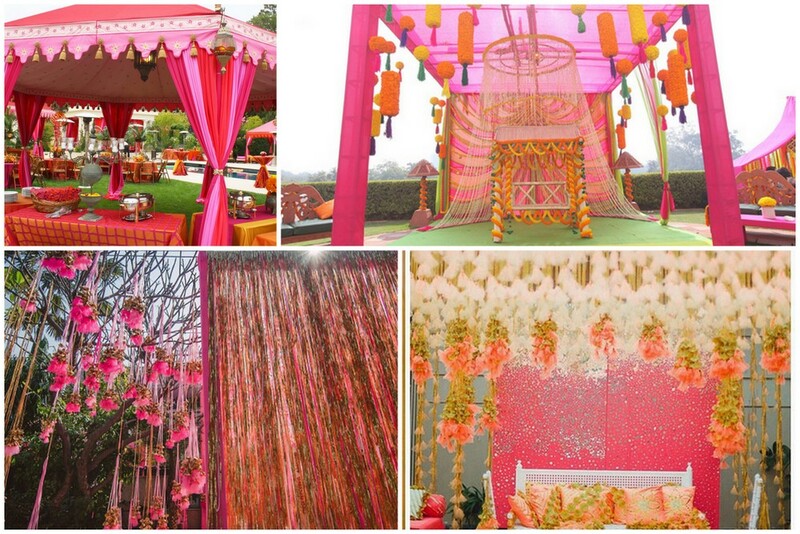 Every part of the country celebrates its weddings in its own unique way. Wedding preparation brings a lot of organizing and decision making. You can make the preparation process easy with the help of various ideas mentioned below for decorations, wedding outfits and the destinations. Flower : Flowers continue to be one of the popular choices for decorations. While roses are classics, tulips are refreshing, and lilacs breathe elegance. Flowers must be used according to the stage decor, theme of the wedding. Different types of flowers including artificial ones can be combined beautifully using ribbons and then be strategically placed. Lighting: Candles and lanterns add the much-needed softness to the venue. It not only lights up the place, but also looks stunning. Fabrics: Multi-coloured and different fabrics draped together create a dramatic effect. Just be sure of the quality of fabric used as it will affect the final look. Coordination: The decor of core areas like entrance, stage, seating, photo-opt, lounge areas and the linens is colour-coordinated. Stylish Seating: Make sure that there is ample seating for your guests, and it is stylish. Be sure to dress up the banquet chairs with nice linen, which is not torn or damaged. You can decorate them with coloured sash, ribbons, flowers or crystals. The Central Point: Enhance the overall look of the venue with this simple addition. Central pieces glam up the look instantly. Food Layout: Laying out the food, and displaying it well is an art. Make sure that the display of food, ingredients and chef's techniques is superbly creative so it engages the guest more. Choosing the attire for the D-Day is one of the toughest decision for the bride as well as the groom. These options would help you in finding the perfect attire for your special day. Sarees: Elegant, sophisticated and stylish, the saree is a widely popular choice in India. Wedding sarees are generally in rich colours and feature opulent designs. There is a mind-boggling variety of sarees available in India, of which some of the most popular ones in a wedding are Banarasi, Kanjivaram, Zardosi, etc. Lehenga: Another popular wedding attire, a lehenga comprises a long, heavily embroidered and ornate skirt worn with a waist-length blouse and a dupatta. Lehengas are available in a wide range of colours, cuts and fits to suit every kind of taste, personality and budget group. Salwar Kameez: A wedding Salwar Kameez comprises a well-fitting, heavily embroidered knee-length tunic, loose pleated pants and an embellished dupatta. Traditional Sherwani: Sherwani is generally the first choice of every Indian groom. It is actually a traditional outfit, but can be modified for Indo-western look. The dress consists of an overcoat and a pyjama/dhoti at the bottom. The overcoat is heavily embroidered and embellished that makes it suitable for the occasions. Kurta Pyjama: Sherwani is generally heavy and for many grooms it may not be feasible to carry a sherwani. In such instances, they can always consider the option of wearing a kurta pyjama. Kurta pyjama is again a traditional outfit and makes a perfect choice for the wedding day. Wedding kurtas for men are available in different styles and patterns and grooms can get one designed according to their taste and body type. Suits and Tuxedos: Grooms have the option of wearing western suits and tuxedos on the big day. To look best in a tuxedo, you need to ensure that it fits well. An ill-fitted suit will simply ruin your entire look. So, buy a suit for the wedding only if you can manage to find a skilled tailor. Choosing a formal invitation card for your guests is indeed a time taking task. You cannot go wrong with it. There is an extensive range of Indian Wedding Invitation Designs from which you can choose your favourite one. Traditional cards in bright prints, modern or contemporary designs, scroll cards are the popular ones. You can also opt for a personalized card. Kerala: Popularly known as "God's Own Country," if you are looking at a wedding in a secluded place or in the centre of a vibrant city, Kerala can offer all these for you to have a wedding you will never forget. Choose a beach wedding at Kovalam, in the heritage buildings of Fort Kochi, or amidst the sprawling tea gardens of Munnar or the mesmerizing backwaters of Alleppey. Goa: The coconut palms, the beachside and the traditional Feni would add colour and fun to your wedding celebrations. Goa has its own seafood feast that could leave you and your family and friends, remember the wedding as a special occasion and moment to memorize the rest of their lives. If you relish, beach side weddings, Goa would be the best choice. Rajasthan: If you like Lakes and Palaces, consider tying the knot in the royal Rajasthan. There are various destinations like Jodhpur, Udaipur and Jaipur to choose from. Several Palace hotels promote destination wedding, with perfect settings to suit your requirements.